Natural by Drew Estate is a cigar all its own. As far as we know, no other manufacturer has attempted to blend a cigar with tobaccos from 12, count ‘em, 12 countries, before Drew Estate created the Natural line. These babies are chock full of long leaves from—take a deep breath—Brazil, Cameroon, the Dominican Republic, Haiti, Honduras, Indonesia, Italy, Mexico, Nicaragua, Syria, Turkey, and several locales in the United States. This makes for a smoke with countless nuances, including chocolate, coffee, black pepper, red pepper, cream, cedar, oak, vanilla, and many others that you could swear is flavored, but the fact that it’s not is its very namesake. Top that off with the impeccable construction that made Drew Estate famous and you’ve got a complex stogie that will wow just about anybody, from the flavor-craving newbie to the seasoned aficionado. Good Day Everyone! The owner of the Owl Smoke Shop in Worcester MA recommended this to me a year ago & when money permits me to do so, I've been enjoying my new number 1 cigar. If you find the Acids "to sweet", try this. So good you'll burn your fingers smoking it down to a nub! I have been smoking this brand of cigars for 10 years and have never been disappointed. They have a sweet aroma and taste. I get many compliments from people who get a whiff of my smoke and ask for the name of the cigar. I have been smoking these cigars for over seven years now and love them as much today as I did in the beginning. Everyone who smells the aroma of the cigars comment positively about the sweet and pleasant odor. 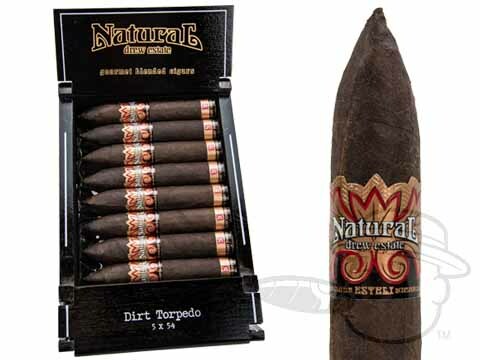 As a result, several of my friends and family have now taken up smoking the Natural Dirt Torpedoes. The Dirt Torpedo and the Clean Robusto (both by Drew Estates) are the only cigars I smoke. Just the right size. Flavor and price perfect too! I have no complaints about this smoke. It has a noticeable flavor of mixed tobaccos. It never falls apart. It smokes with an easy draw, yet it seems to be a slow and measured burn. I enjoy the chewy texture near the finish. Everyone that I share one with always says, "Wow, this is a really good cigar." This is my third box order of these babies! Not only do I love them, but just about everybody I have offered one up to has asked for another. Including a few of my lady friends! Love the smooth coffee and chocolate notes from this stick! Creamy smoke and light sweet taste on your lips makes this a great go to smoke! Thank you Drew Estates for this wonderful twist on full body smokes! The surprise began the moment I tasted the unlit cigar. The tip was heavy flavored. An almost syrupy, cherry taste. The appearance, construction and draw and burn are excellent. They remain so for the entire experience. Note, I am not a flavored cigar person, hence the low scores for flavor and complexity. The true natural taste can be experienced in the last third. It is enjoyable. The strong flavor over shadows most of the short smoking time. If you enjoy a flavored smoke, I would not miss this experience. Buy a box. If not, you should at least try one and enjoy the other fine qualities of this cigar. Nicely made and an even better smoke. Balance smoky-sweet taste with a nice draw and tasty finish. Not too sweet but a nice smooth cigar with a great taste and easy burn. Like no other cigar that I've ever smoked, You owe it to your self to try this baby. I have been purchasing The Natural Dirt Torpedo from Best Price Cigars for over 10 years (I think more). It is one of my top three cigar choices and Best Price Cigar truly has the best price on this cigar. Thank you! These Stogies are the best of the best, thanks. Built well. Nice flavor. Sometimes you get an uneven burn. But overall great everyday stick. I was introduced to these by a friend and haven't bought any other since then. Their appearance, flavor and smell make them the best yet for my taste. The combination of a sweet taste and a very pleasant smell always lets the peaople around ask about this top cigar. I have been smoking these cigars for 12 years and find them truly enjoyable and so do my friends. They are mild, burn well, have a sweet taste and aroma. Great everyday cigar. Starts smooth and creamy and evocles into a more spicy flavor. Construction is good and burns pretty even most of the time. Went to a cigar shop in Napa Valley years back and this was one of the cigars that were recommended. Tried several different ones, but this one was perfect. I liked the flavor, the sweet paper, and it's the perfect size. I've gotten so many compliments on it. I've ordered theses for the past several years from here. First time trying an "infused" cigar and gotta say, I like it! I am more of a traditionalist in cigar selections, I usually reach for a nice Oliva, AB Persando or an AF Maduro but wanted to try one of the infused Drew Estates and am very glad I did. Great taste on the palate, leaves a nice aftertaste on the lips. Pleasant aroma that lingers in the room during and after smoking. If you're looking for a mild cigar for when a friend that normally doesn't smoke but insists ongoing so, reach for one of these, you and they both will be happy you did. Best tasting and aromatic cigar I have every had. I will always have these in the humidor. This is my favorite go to Cigar, and Drew Estate has done an awesome job with this...Also they make an excellent fermented Pappy Van Winkle Cigar!!!! Absolutely love the Drew Estate Natural....my favorite go-to cigar....buying them from this website is easy and more affordable than purchasing from my local source! These are tasty cigars. Have smoked them for several years. Burn even, do not burn hot, never require a relight. Not considered a "flavored" cigar. Have smoked them to the point I need roach clips. They are that good. Also, I am continually impressed with BCP service. These cigars arrived 3 days after placing the order. When they are gone, I will order more. These are ultra smooth with a creamy coffee flavor and are a perfect morning smoke with a cup of Joe! AS FAR AS I KNOW, ALL THE DREW ESTATE CIGARS ARE GOOD, EXPECT JUCY LUCI, TO SHORT AND GET HOT BEFORE FINISHING THEM. These are very flavorful and burn really well. Larutan Dirt Torpedo By Drew Estate is rated 4.7 out of 5 based on 36 customer ratings. Do these come individually wrapped inside the box? Yes. These cigars are each individually wrapped in cellophane!